Official web site of Alle-West Fastpitch Inc. and the Alle-West Hurricane tournament teams. Most of our members and roster players are from Allegheny and Westmoreland counties in the Pittsburgh, PA area. In Memory - We are shocked and heartbroken over the February 11, 2013 loss of Coach Chris Cortazzo. Chris was a driving force in the success of our Alle-West Hurricane tournament teams. His years of hard work and dedication will always be remembered, and his friendship will be treasured. Although our Hurricane players have now moved on in their athletic, academic, and professional careers, the Hurricane families remain a close-knit group. Our thoughts and prayers are with Dee, Kirstie and Delaney at this difficult time. 2011 High School Competition - Congratulations to all of our Alle-West Hurricane players for your succesful high school seasons! 2011 Alle-West Hurricane 18U Roster - The 2011 Alle-West Hurricane 18U team includes: Holly Glass, Delaney Cortazzo, Marissa D'Angelo, Gabi Vogt, Taylor Geary, Jessie Fine, Brystol Johnson, Katey Potopenko, Alexis Ryan, Kelsey Schorr, and Sarah Jacobs. Best of luck to the 18U Hurricane! 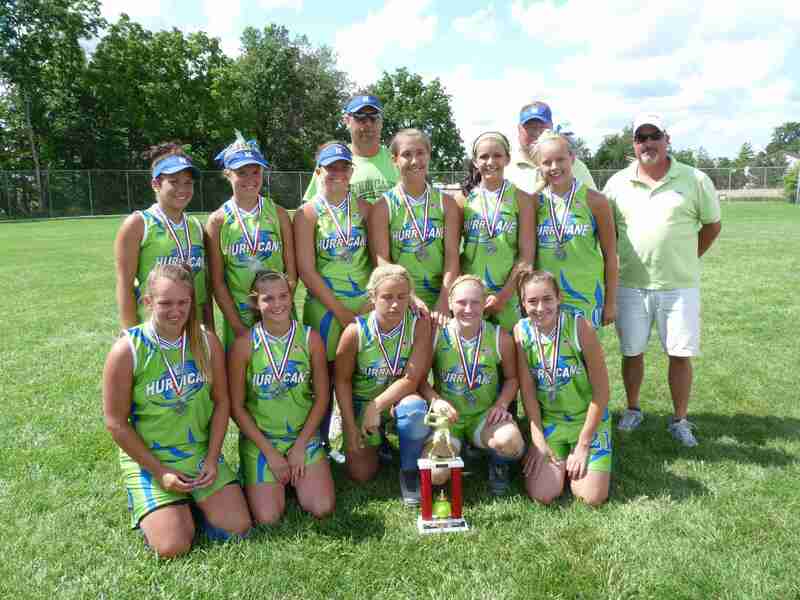 "18u: Runners-up 2 Weeks in a Row" - Alle-West Hurricane 18u battled through injuries for 2nd-place hardware at Lower Burrell (July 4, 2010) and Monroeville (July 11, 2010). Congratulations to Hurricane 18u - great work by a dedicated and hard-working team! "Gold" in Chambersburg! - Alle-West Hurricane 16u earned a number 10 seed in the gold bracket out of 54 teams at PA Softball's June 25-27, 2010 Firecracker College Showcase, then earned "Elite 8" plaques and a 4th place finish. Congratulations to Hurricane 16u for another great performance!! 16u Champions in Beaver! - Alle-West Hurricane 16u brought home the championship hardware, going undefeated with seven straight wins at Green Valley Park in the June 18-20, 2010 Summer's Rage tournament. Another Father's Day to remember, as Hurricane bats were blazing, and the 'Canes defense was fantastic!!! 2010 Alle-West Hurricane 14U Roster - The 2010 Alle-West Hurricane 14U roster: Kaylyn Andress, Jessica Carpenter, Monica Joseph, Andrea Lash, Courtney Lubick, Brennah Martik, Amy McNeill, Brenna Meyer, Marla Small, Morgan Willaman, and Sydnei Zalice. Go 'Canes! 2010 Alle-West Hurricane 16U Roster - After a fantastic 14U season in 2009 with two tournament championships, one second-place and two third-place finishes, the 2010 Alle-West Hurricane 16U roster: Haley Borkovich, Delaney Cortazzo, Marissa D'Angelo, Taylor Geary, Jessie Fine, Brystol Johnson, Katey Potopenko, Taylor Johns, Jessica Rohaus, Sarah Rupchak, Alexis Ryan, Kelsey Surmacz, and Dani Wally. 2nd Place Finish in Toledo!!! - Hurricane 14U finished their season by earning a spot in the championship game of Toledo's 2009 Fastpitch Classic. Although that outcome was a hard-fought 3-2 loss at the hands of Michigan Elite, Hurricane spirits were high as the ladies came home with 2nd place hardware - cangratulations 'Canes! All-Section 2009 - Hurricane 18U players receiving Post Gazette 2009 All-Section honors include: Valya Hobaugh (Penn Trafford), Julia Eck (Avonworth), Kirstie Cortazzo (Jeannette), Amanda Forkey (South Allegheny), Gabi Vogt (South Allegheny), and Laine D'Angelo (South Allegheny). Congratulations! MSA/Kennywood All-Stars - Laine D'Angelo (pitcher - South Allegheny) and Kirstie Cortazzo (shortstop - Jeannette) of Alle-West Hurricane 18U were named to the MSA Sports/Kennywood 2009 All-Star Team - Congratulations! Hurricane 14U - Champs at Monroeville! - We witnessed a super weekend of softball at the 2009 Fastpitch Challenge in Monroeville, with Hurricane 14U running the table for a 6-0 record and a championship trophy! Hurricane bats were on fire, and the stingy defense would not be denied. Congratulations to Alle-West Hurricane 14U - "Go 'Canes!" Spano Dome Tournament - Hurricane 14U put on a good show in the NSA Qualifier on February 21-22, 2009 at Spano Dome in Akron, OH. 3 wins and 1 loss - looking forward to a successful 2009 tournament season! Hurricane 18U Holiday Party! - 2009 Hurricane 18U's team meeting and Holiday party was a smashing success! Thanks to Jon and Kim for hosting, and thanks to all of the parents and players - best of luck in 2009 to the 18U Hurricane! Penn Twp, May 24-25, 2008 - Alle-West Hurricane 18U earned runners-up honors and a World Series berth at the NSA state qualifier with elimination-round victories over Roadrunners-Davin (11-2) and over Roadrunners-Capp (2-1). Congrats to Hurricane 18U for a fine performance at PT! February All-Nighters - A Hurricane warning was in effect for Greentree, PA on February 9 - and the Alle-West Hurricane rocked Greentree Sportsplex! 18U defeated Thunder 8-2, then ended the night with a 10-0 decision over Rage. 14U dropped a 2-1 decision to Altoona, then bounced back with a 5-2 victory over Rage. Congrats to the 18U and 14U Hurricane ladies for a great start in 2008!!! Beach Finale 2007 - The 16U Alle-West Hurricane wound up its 2007 season in Myrtle Beach, South Carolina representing Pennsylvania at the WFC World Series - a week of fun in the sun - and a 4-2 world series record! Next up: 18U competition! Ohio Valley Stars Classic 2007 - 3rd Place- The 16U Alle-West Hurricane earned wins over Vipers East, Lady Renegades, Morgantown Mohawks, Cambria County Cobras and Predators before dropping a 1-0 semifinal battle to Vipers East. Nice job'Canes!!! Beaver Bash 2007 - 3rd Place - The 16U Alle-West Hurricane blew through Beaver with wins over Roadrunners, Valley Rage (Congrats to Laine for pitching a no-hitter! ), Lightning and Wildfire for a third place finish. Chambersburg PA, July 6-8, 2007 - 2nd Place! - Congratulations to the Alle-West Hurricane 12U team for another strong performance, bringing home runners-up trophies from PA Softball's Firecracker Showcase tournament - WOW! Center Twp PA 2007 - 1st Place!!! - Congratulations to the Alle-West Hurricane 12U team for a great weekend of softball, bringing home championship trophies from the Summer's Rage tournament! Hurricane 16U finished in third place, with wins over Valley Rage, Thunder, Vipers East and Diamond Stars, but dropping the semifinal game - a nine-inning international tiebreaker decision to the Pride. Washington Twp PA 2007 - 2nd Place!!! - Hurricane 16U came up with a great Father's Day performance for a second place finish and an ASA Eastern National tournament berth, with elimination round victories over Predators and Power Becker, then battling the Renegades to a final game international tiebreaker. Hurricane 12U also came home with second place trophies - for the first time, Hurricane hardware was earned in two age categories... Congrats to the 12U and 16U Alle-West Hurricane teams - Go 'Canes!!! Penn Twp PA 2007 - PT's Memorial Day weekend tournament had the Hurricane 16U defeating Whitby Eagles 5-1, Predators 4-3, and Power 9-1. After a brilliant 3-run comeback during a rain-shortened Saturday evening game, Hurricane's 3-2 6th inning lead was erased by a shortened 5-minute "drop dead" time limit and the Roadrunners walked away with a 2-0 victory. After Sunday morning's 3-1 victory over Evolution, Hurricane faced off with Spirit (W). As Hurricane pitching and defense shut down the Spirit, an inspired Hurricane offense scored one run. A second Hurricane run was denied by an erroneous "out" call at home after the Hurricane runner avoided the Spirit catcher's tag. Spirit went on to hold off Hurricane scoring threats and won in the extra inning international tiebreaker. Congrats to Hurricane players for outstanding play at the NSA WPA Championships! 2007 Pre-Season Scrimmage Thanks - Thanks to John Dolan and the 16U Evolution for the April 22 scrimmage, and to Harry Rutherford and the 12U Renegades for the Saturday, March 31 scrimmage. Tournament Results - "February Frenzy 2007" was a success for both Hurricane teams. Congratulations to Hurricane 12U (3-0) and 16U (1-1-1) teams. Fundraising Thanks - The spaghetti dinner at Paintertown Fire Hall was a delicious and successful event! 12U and 16U parents did a great job preparing the meals, and our servers can't be beat! And of course, our thanks go out to the 250+ Alle-West Hurricane supporters who enjoyed the January 21 spaghetti dinner! More Fundraising - The 12U/16U spaghetti dinner at Glassport PNA Lodge 750 was a fun and successful event! And the 16U catering fundraisers were successful too - thanks to all of the Alle-West parents and players who worked these events! 2006 Season Recap - Click "2006 Results" in the menu at left for a review of the Hurricane's second year of tournament competition. 2005 Season Recap - Click "2005 Results" in the menu at left for a review of the inaugural Hurricane tournament season. About Alle-West Fastpitch - Click "Our Philosophy" in the left column to review the principles which guide our organization.